Spoilt for culture, spoilt for the spirit and most of all spoilt for food, the people of Hong Kong have had it easy with convenient access to every cuisine popped just around the corner for a craving induced face stuffing. Being so spoilt for choice, however, has left many of us with a dreaded condition known as “I don’t know, you decide” syndrome, a common ailment that has side effects of stress, indecisiveness, hunger and, in serious cases, a divide in even the tightest of cliques. Luckily I have taken it upon myself to go on an adventure and try some of the dishes less prominent on the menus, but with the most fulfilling results. My first stop was to the heart of the city, up on Hollywood road. Engines roar up the one-way street, gracefully navigating through the parked lorries and workers pushing trolleys filled with market fresh ingredients to the plentiful restaurants dotted from Soho and all the way down Wyndham Street, there’s certainly no hiding from the hectic city life here. 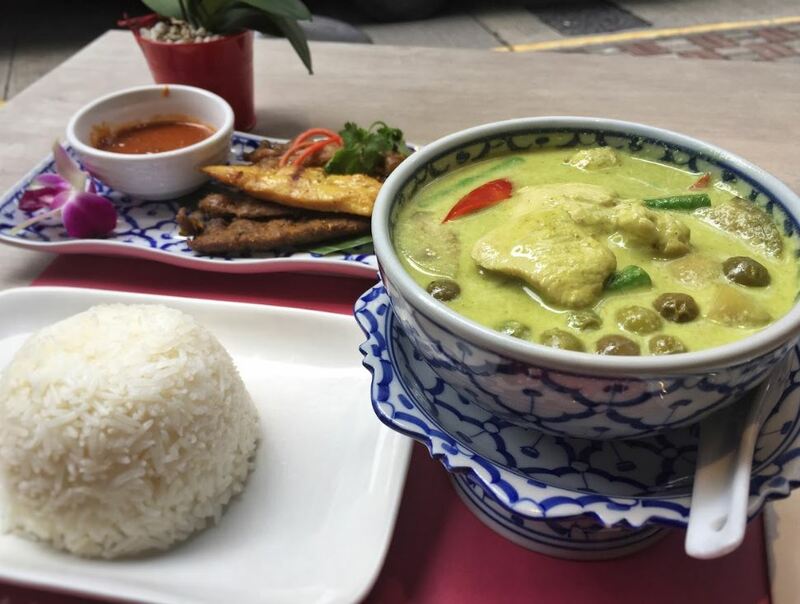 Ayuthaiya is quaintly located at the bottom of Shelley Street, with three tables outdoors ideal for watching the busy lives of Hong Kong swing by. Obviously, if the sounds of the city are too much, head into the main seating area for a more intimate dining experience. Being in a Thai restaurant I just had to try the satays, a staple in my diet since I was just a wee one. Unable to make my mind up about which meat took my fancy, I was lucky enough to get a platter of all three; pork, chicken and beef, presented with a side of tangy homemade peanut sauce, with chunks of ingredients mixed in to give it an extra crunch. Clearly marinated for hours and cooked just right, the meat practically fell off the skewers ready to be consumed. And of course, who can resist a classic green curry. The spicy broth contained chicken (or pork, squid or beef, if you so prefer), green peas, chilli peppers and aubergine, offered up in a beautiful tall bowl with a plate of steamed rice to cool your tongue if you aren’t so spice inclined. Packed full of authentic flavours, my spoon hardly had time for a break as I demolished every lick before the plate hit my table. 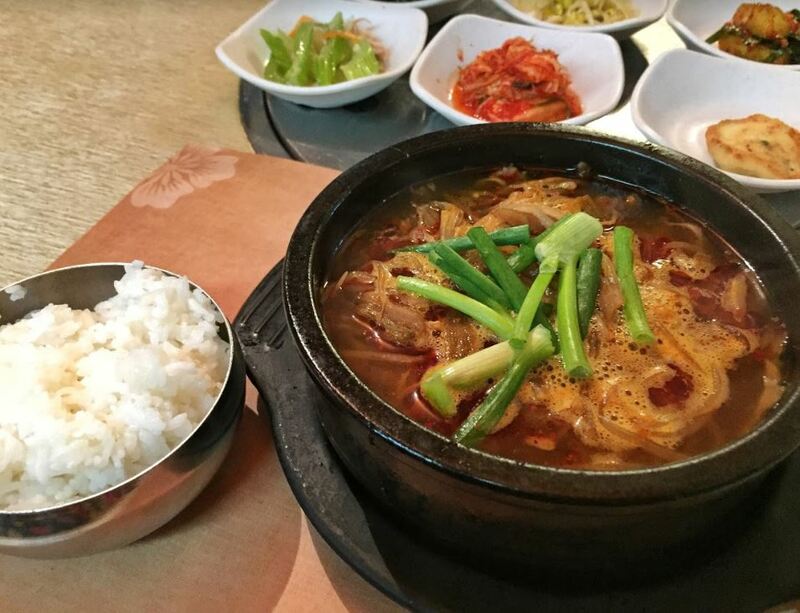 As with most Korean restaurants, dinner is not just something you do every evening, it is an experience, a production that takes you on a culinary journey from start to end. Walking through the doors, you are presented with a flurry of smiles and escorted to your table complete with a barbeque in the middle. The menu is more of a catalogue bursting with tantalising treats to be shared with the whole group. Once I had ordered my spicy beef soup, my table was filled up with a variety of Korean pre-dinner nibbles; Kimchi, bean sprouts, seasoned veg and potato cakes. I resisted filling myself up as I knew the drama would soon start as the lead player (the spicy soup) came upon the stage (my table) to deliver its final soliloquy (be eaten). The stew comes in a rather intimidating shade of red, and while it does have a slight kick to it, the soft noodles and side of rice are there to cool you off if the heat gets too much. Slurp up the veggies as you look out of the second-floor window over the Sheung Wan traffic, or perhaps have a little eavesdrop on the chatty groups of pals cooking up dinner over their personal BBQs on the surrounding tables. Even arriving after 1 pm, this hidden hotspot has proven to be quite the local favourite. The main area of the restaurant was completely packed meaning I was taken slightly down Hau Wo Street to a discreet second dining area – a simple room with several tables to seat those who had missed the first rush. My concern that there would be nobody to take my order was swiftly removed as the friendly waiter popped his head through the entrance every few moments to care for hungry residents. 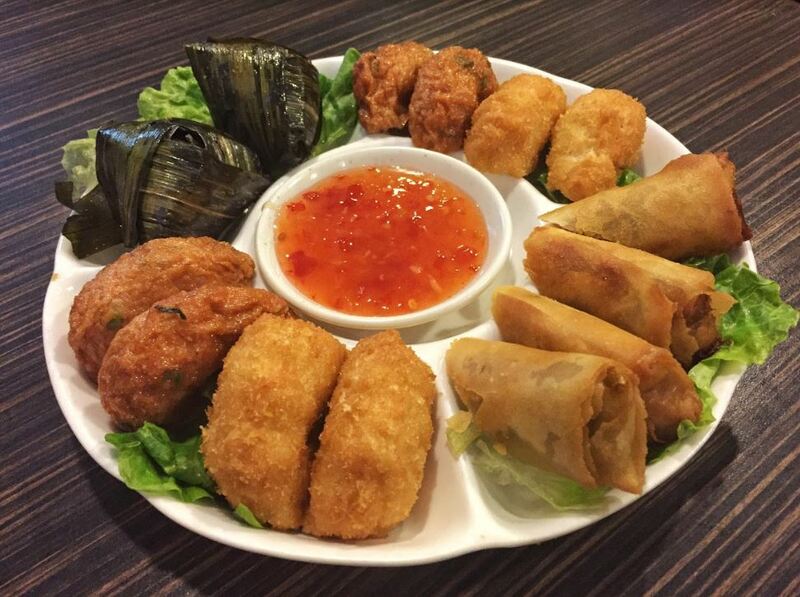 Being in a finger food mood, the starter platter immediately caught my eye and like wild animals around a watering hole, each piece of the combo was neatly placed around a bowl of Thai sweet chilli sauce waiting its turn to take a dip. Plenty of textures were involved in this meal, from the flakes of the spring roll pastry to the spongy shrimp, the tender shine of the chicken to the crunch of ginger within the fish cakes. Even though quite content with my array of munchies, I couldn’t help but have a sneak peek over the shoulders of my neighbours and feel a hint of jealousy that I couldn’t grab a forkful of their lunches, but all it means is I shall have to take another trip down to Kennedy Town for round two. Are you an indecisive eater? No matter your style, you will find something you love on foodpanda. 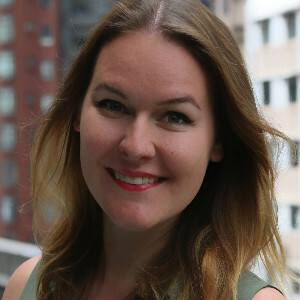 Having lived in Hong Kong for 22 years, Kate’s appetite for discovering hot new places has only been encouraged by the city’s obsession with food – and through eating all of it! Keeping up may be a challenge but it’s one she’s willing to take. Have a laugh with her on Twitter @kaate852.